Hi there, stranger! Long time no see... How has your summer been so far? My summer has been good in many ways, but also challenging here and there. One thing is for sure though, I have been knitting all through summer! It has almost been a year since we moved back to Manhattan and although I am very happy to be here, at times this energetic city can be a hard place to be in for me. This city is intense, I tell you. I have never ever experienced such loud noises, stampedes of people, and not to mention hot and humid weather. For a moment there, everything became a little bit too much for me and all I wanted is to lock myself up in the apartment, crank up the AC and just sit and knit. 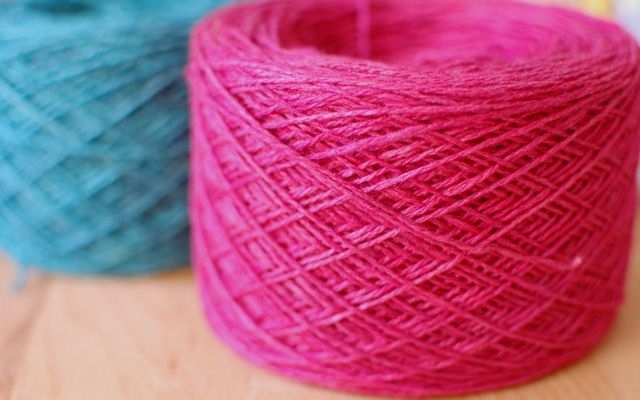 I wanted to cancel out the hard concrete jungle that I find myself in, and just be occupied with soft and luscious yarn. Hurray for my knitting community! Many a times, I thank my lucky lucky stars for my knitting community. Really, I would be lost without it. Several days a week, I am knitting away at Yarn Shop Cafe La Casita in Brooklyn and chitter chatter away with my dear knitting friends all the while enjoying the air conditioning. It is through encounters at La Casita that many opportunities have been presented to me like precious gifts. At this very friendly yarn store, I have been introduced to the yarn company Jade Sapphire for who I am designing for currently. I also have had the wonderful opportunity to work for a very talented knitwear designer (more of that later can't give out details at this moment). 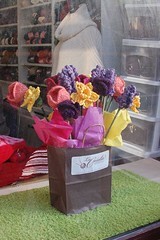 Another precious yarn shop which I frequent regularly is Knitty City on the Upper West Side. I always enjoy my visits up there, petting yarn and chatting away with everybody. 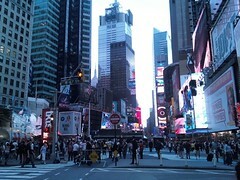 Oh boy, I tell you... without my knitting community, I would be truly lost in this big big city! By now many of you know that I designed several accessory items for Jade Sapphire. I felt so lucky to be given this wonderful opportunity and was really flabbergasted when Jade Sapphire featured my designs the way they did during TNNA last June. After TNNA in June, I was really anxious about how my designs would be received by yarn shop owners. Many insecure feelings would overwhelm me and many questions would circle around my head... Will yarn shop owners be into my aesthetics? Will they order pattens or won't they care? Will knitters like the way I write my patterns? Or will they hate it? Several weeks ago, Jade Sapphire has approached me once again and I am going to design pieces for them for the next TNNA in January...Woohooo! This is proof that things are going well! 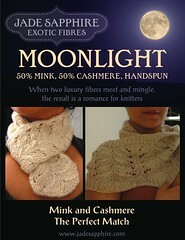 Right now, I am playing and swatching with their Silk Cashmere...hmmm, such beautiful and soft yarn! I am really curious how your summer has been so far... Have you been knitting alot? Or maybe not at all? Okay, signing off now. My husband and I are getting ready for hurricane Irene that is to "grace" the East Coast this weekend. PS: I didn't feel the earth move last Tuesday. I was busy knitting! Submitted by Anonymous on Fri, 08/26/2011 - 22:14. Submitted by Nancy Ricci on Sat, 08/27/2011 - 10:57. Several of my New York knitting friends went to Sock Summit and I enjoyed hearing their PDX stories. Oooh, that is a very pretty design that Zen Rain Shawlette of yours. Congratulation with its release! Submitted by Anonymous on Fri, 08/26/2011 - 14:14. Hi Nancy: I hope that the hurricane bypasses Manhattan and that you are spared the crazy weather. Sometimes it's a false alarm. My summer was busy. Busy teaching :-). But I did have a chance to take a whirlwind two week vacation to see my children. One week in PDX which was FANTASTIC. I even had a chance to visit the wonderful knitting group at Close Knit. After that my daughter and I flew to Chicago and then took the train to Indiana to visit my son. The three of us get together at least once per year - I wish it was more! In any case you are a brave soul to brave the big city. I admire you and your journey as a designer. Spectacular! Submitted by Nancy Ricci on Fri, 08/26/2011 - 16:05. This must be the talented Chris from the knitting blog "alice thelma"! I think of you often, you were the very first one who ever asked me for an interview. That was such an honor!